— The JVM410HJSB with matching 1960AJSB. 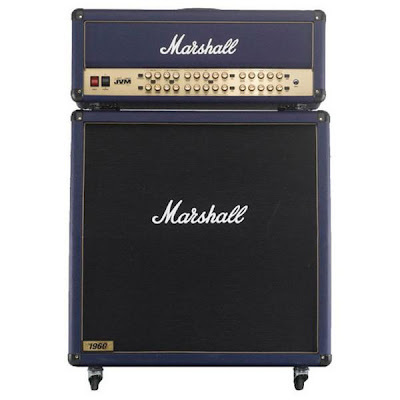 Marshall have revamped the JVM410H and worked closely with Joe to offer some great new features. 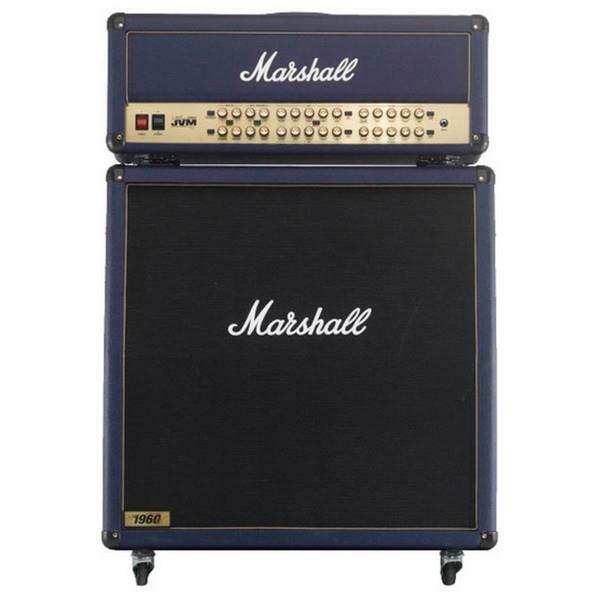 This Blue half stack edition is a limited edition worldwide and is only available as a head and cabinet combination. The four reverb pots from the original JVM410 have now been replaced with noise gates; four noise gates no less, one for each channel and each with their own threshold. Another visible change to the front panel is the addition of a "Mid Shift" button that can be used for both ODI and OD2 channels, shifting the mid character of the sound to that of Joe's specification. Tone wise, the amplifier is very different: The Clean channel is based on the aforementioned 6100 when on the green mode, with the orange and red modes being hotter variations of that tone too. The crunch channel takes the original JVM410 crunch and adds some of the popular Marshall AFD circuit to it. and the OD channels are now both voiced identically, based on the JVM410 ODI but with the gain scaled back slightly and a smoother transition between modes.